Juanita Johnson came to Colfax Health and Rehab following hip replacement surgery. After less than two weeks she was ready to return to her home. 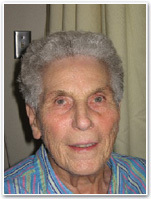 Juanita states, " If it was not for the therapy, I would not have been up and about like I am and I would not have been able to return home as quickly as I did. They got me up and moving right away. I was able to bring home the tools that I needed to be independent." When asked if she would recommend this facility and thrapy team to others she said, "Absolutely!" 1011 University Ave. Colfax, WI 54730 Phone: 715-962-3186 Copyright 2010 Colfax Health & Rehabilitation Center. All rights reserved.